Rewritten and updated: This award-winning book, which sold over 40,000 copies in previous editions, has been completely rewritten as a resource for people at all levels of responsibility in any type of organization and contains new case studies, tips, tools, and exercises. Proven effective: The authors have worked with hundreds of organizations around the world in private industry, government, higher education, and the nonprofit sector, including American Express, AstraZeneca, Johnson & Johnson, and Walt Disney World, as well as the US Army, Harvard University, and Yale University. Trust is a key differentiator for high-performing organizations. It makes bold initiatives possible, difficult transitions easier, and everyday workflow more effective. Yet trust can be hard to build and sustain because most people aren’t aware of the subtle and unintentional ways they test and break trust in their workplace relationships every day. 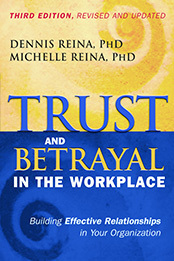 In this updated edition of their award-winning book, Dennis and Michelle Reina show how anyone at any level—not just those at the top—can take action and change his or her behavior to create, build, and sustain trust in the workplace. Drawing on over twenty years of research and experience in hundreds of organizations, the Reinas define the three key dimensions of trust and describe the specific everyday behaviors that build each dimension. They provide a proven seven-step process for restoring trust when it’s been tested or betrayed and offer completely new material for strengthening self-trust. This book is about the power of trust: the energy that exists when it’s present, the pain that arises when it’s been broken, and the transformation that occurs when it’s been restored. This revised edition is a new and improved guide for people who want to unleash the power of what they’re able to accomplish through building trust-based workplace relationships.